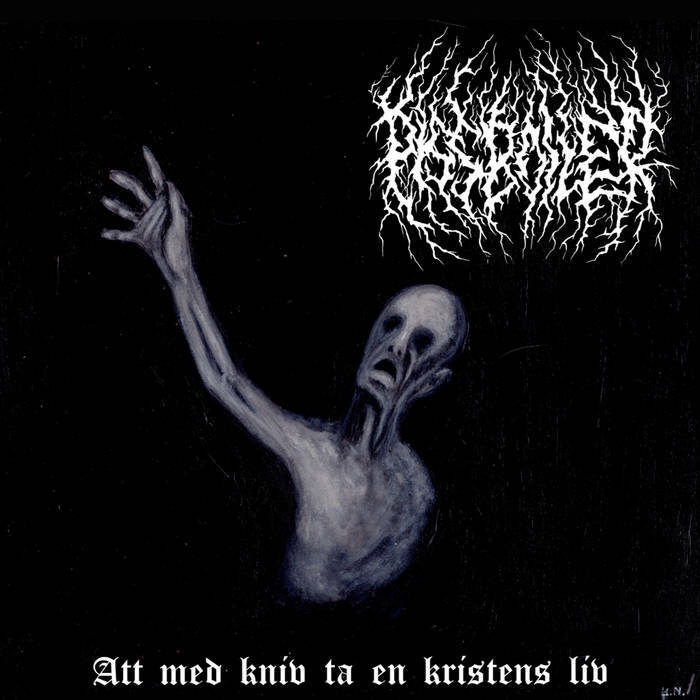 Pissboiler are a Swedish doom band, and this is their latest EP. I won’t deny that I’ve been really looking forward to hearing this one. Ever since I was subjected to the sheer aural horror of 2017’s In the Lair of Lucid Nightmares, I’ve craved more of Pissboiler’s filth and disease to swamp myself in. Well, now is the time, and Att Med Kniv Ta En Kristens Liv contains a further 50 minutes of utter terror, misery, and pain for everyone to wallow in. Wait, an EP lasting 50 minutes? Well, sort of – the new EP consists of the first three tracks, (24 minutes), but a remixed and remastered version of the band’s contribution to their split with Deveikuth has also been thrown in – a colossal song by the name of Monolith of Depression that’s 26 minutes long in its own right. The first song – En Visa för Elden – is the shortest here at just over five minutes in length. It starts off with a clean, quite upbeat guitar, with elements of Pissboiler’s inherent filthiness slowly being brought in. The new EP tracks are part of a concept revolving around a knife murder, so musically En Visa för Elden makes sense in this light – the calm before the storm, if you will. This moves us nicely, (or not, considering the subject), to the second song here, which is also the title track. Slow, heavy, and filled with ugly sludgy doom, this song is a violent nightmare slowed down and given aural form. It’s not without a grim dose of melody either, and the song contains a deep sense of pain and loss. The guttural growls that are used on this song are horrific and nasty. The malevolent dread in this song is immense. The final, and longest track of the conceptual EP is Pt II – Ett Avslut, and this song really draws out the funeral doom that Pissboiler do so well. A rich melody runs throughout this song that provides an emotively mournful core to the horrors that surround it. It’s a fitting way to close off the three-song concept, as it has a real feeling of finality and ending to it. The last track here – the aforementioned Monoloth of Depression – is very aptly named. Unfolding at a glacial pace with clearly evil intentions and a sprawling, relentless intensity, the track is a colossal amalgamation of darkness and woe. So, soooo good. Pissboiler’s new material has not disappointed. I’m already impatient for whatever they do next. This entry was posted in Doom and tagged Doom, Funeral Doom, Metal, Pissboiler, Sludge. Bookmark the permalink.